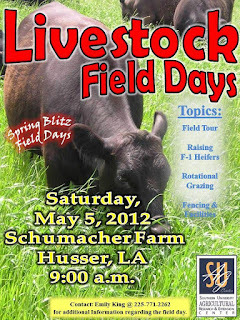 Baton Rouge, LA –The SU Ag Center will host a Livestock Field Day on Saturday, May 5 starting at 9:00 am on the Schumacher Farm in Husser, LA. Topics of discussion will include Raising F-1 Heifers, Rotational Grazing, and Fencing & Facilities. 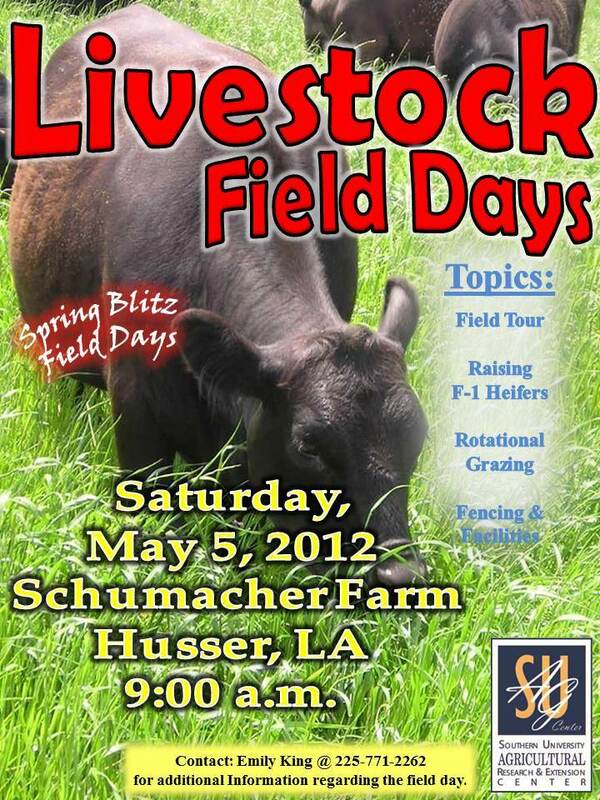 Activities will include cattle farm tour and candle-making demonstration by Mrs. Schumacher. Candle-making with soybean oil was the basis of a very successful business for the Schumachers who produce replacement heifers. For more information, please see attached file or contact Emily King at 225-771-2262. BATON ROUGE, LA - The Southern University Agricultural Research and Extension Center hosted a symposium on climate change and ecosystem, April 24 at A. O. Williams Hall, attracting presenters from the United States and China. The goal of the symposium was to share research and educational information on how the change in climate and ecosystem is affecting the forests, wetlands and water, and ways to mitigate them for sustainability. The SU Ag Center Chancellor Leodrey Williams; Vice Chancellor for Research, Adell Brown, Jr.; Vice Chancellor for Extension Gina E. Eubanks; and Vice Chancellor, SU Office for Research and Strategic Initiatives, Michael Stubblefield brought greetings to symposium participants. During his welcome address, Chancellor Williams emphasized the relevance of the symposium to the current climatic changes that continue to have negative impacts on the United States and the world at large. 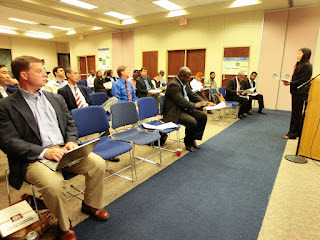 Among the presenters were students, faculty and professionals from organizations such as Southern University; Louisiana State University; Columbia University; USDA Forest Service; U.S. Geological Survey; East Carolina University; University of Southern Mississippi; and Northeast Institute of Geography and Agroecology Institute, Chinese Academy of Sciences, Changchun, P.R. China. Discussions included topics such as, An overview of trends, projections and potential ecosystem impacts in the Southeastern United States; An ecosystem approach to climate change and urban forestry education and research; What we know and how we know it; The role of the US Forest Service in climate change science and management; and Modeling and assessing the impact of climate change on the Amite River Ecosystem, among others. 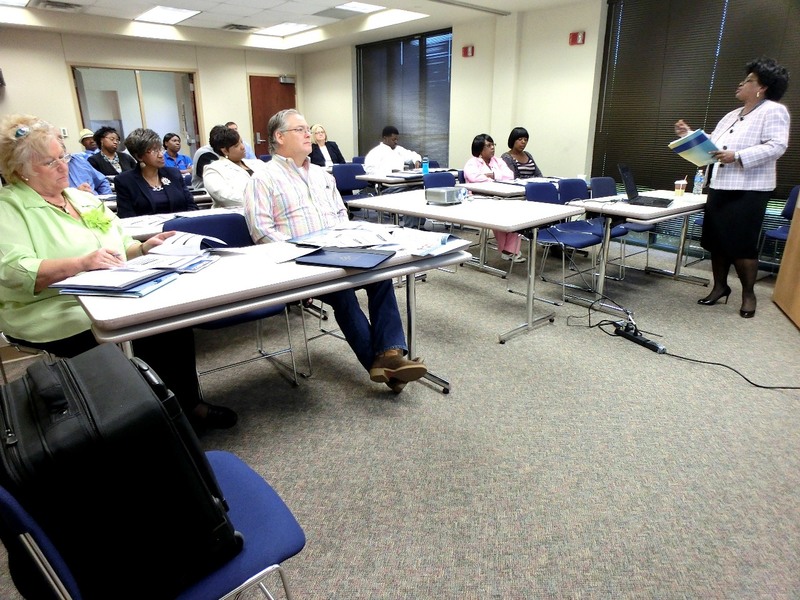 BATON ROUGE, LA: More than 30 participants assembled at the Southern University Agricultural Research and Extension Center on April 24 for a “HUBZone” training event sponsored by the U. S. Small Business Administration (SBA). This program is designed to help small firms in certain communities gain access to federal contract opportunities. HUBzone areas are typically areas of low median household income or high unemployment, or both. Trainees came from diverse backgrounds across the state to acquire knowledge on how to identify and secure government contracts. They learned about small business contracting programs, how the government buys, how to sell to the government, as well as eligibility and certification requirements. 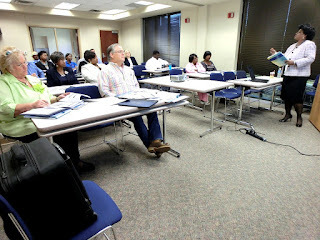 The training was headed by Jo Ann Lawrence, Lead Business Development Specialist in the Louisiana Office of the SBA in New Orleans. The Center for Rural and Small Business Development at the SU Ag Center coordinated the event. For further detail, contact Gloria London, director of Center for Rural and Small Business Development at 225/771-4107, or Eual Hall, business development specialist at 225-771-4105. BATON ROUGE, LA - The Southern University Agricultural Research and Extension Center hosted the 42nd Annual Horse Show, April 20-22 at the Maurice A. Edmond Livestock Show Arena in Baker. 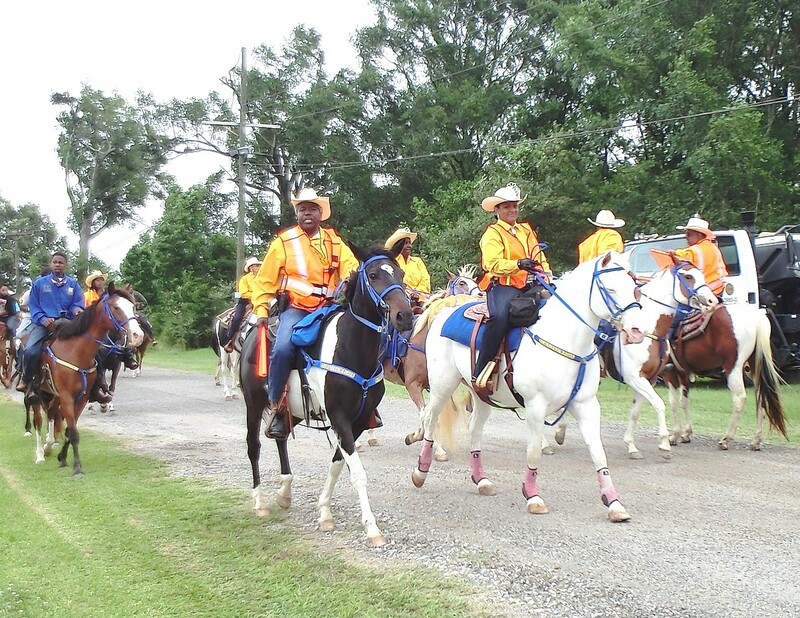 Trail riders from as far as Texas, Mississippi, and North Louisiana traveled to Baton Rouge for the event. This year, the horse parade left from the Livestock Show Arena in Baker to Leland College with different horse riding associations, from which, first and second place winners were selected by judges. More than 75 horses participated in the parade, which included riders of all ages. The gates opened for the three-day event at noon on Friday, a fashion show followed at 6:30 pm, while the ultimate ranch rodeo took place at 7:00 pm. Saturday morning, the events went into full force with the youth ultimate ranch rodeo, stick horse rodeo, and the climax of the show, the trail ride from the Edmond Livestock Arena at noon. After the conclusion of the gated horse show, Leon Chavis and the Zydeco Flames entertained the crowd, followed by J. Paul, Jr. and Zydeco Nubreeds at 9:00 pm. On Sunday, the show came to a close following the Cowboy Church service and Farewell breakfast. Contestant places rabbit in cage for judging. 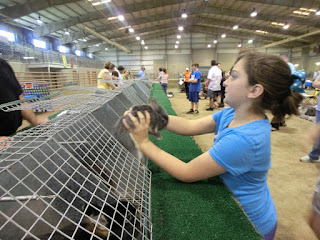 BATON ROUGE, LA - On April 14, youth from across the state gathered at the Maurice A. Edmond Livestock Show Arena in Baker for the annual State and National Rabbit Show, hosted by Southern University Agricultural Research and Extension Center. Family and friends were in attendance to lend support. Buyers were there to take home excellent breeding stock. The Rabbit Show is a gathering of all kinds of rabbit breeds and colors, with children as young as four years old working with siblings to produce a grand family affair. 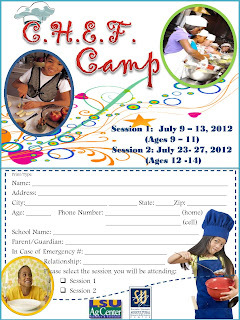 Baton Rouge, LA - This summer, the Southern University Ag Center will sponsor a youth cooking school entitled, “Creating Healthy Enjoyable Foods” (C.H.E.F.) for students ages 9-14. Session 1 for ages 9 -11 will be held July 9th –13th and Session 2 for ages 12–14 will be held July 23rd – 27th. Please share the attached flyer with friends and family members who may be interested. 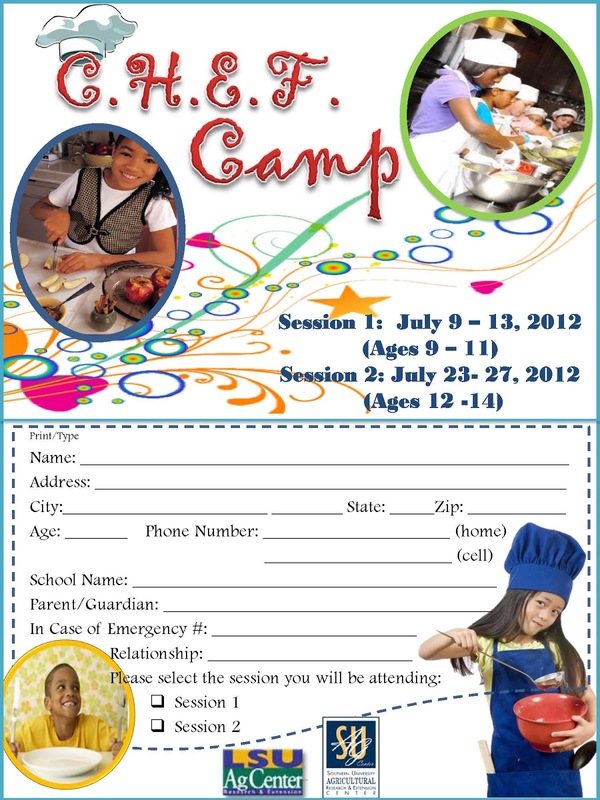 The registration fee for each session is $15.00 per student and covers all materials, food and attire. 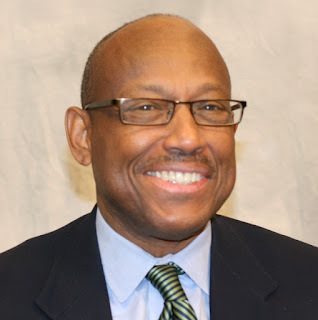 De’Shoin York Friendship is assistant specialist – nutrition, FF-NEWS state coordinator and EFNEP director. A project designed to teach prisoners responsibility, while putting healthy fresh fruits and vegetables on their table is taking root near the parish airport. "This is a win-win-win for us," said St. Landry Parish President Bill Fontenot, who was out at the roughly one-acre garden Tuesday morning. "This is an opportunity for Southern (University) to teach, for our parish government to save some money and for our prisoners to rehabilitate themselves," Fontenot said. Behind him. about a half-dozen trusties planted long rows of tomatoes, green peppers, peas, parsley, sweet corn and hibiscus. "The tomatoes will come in first, then the peppers. We should have corn by the first week in July," said Yemane Ghebreiyessus, with the Southern University Agricultural Research and Extension Center, which is overseeing the project. "We are modeling this on the garden at the Lighthouse Mission. We would like to duplicate that here," Ghebreiyessus said. He said the garden should produce more than enough food for the jail's roughly 250 inmates, with enough left over to sell. "The major purpose of this garden is to give them hands-on experience. They are developing skills they can use to look for a job," said Ghebreiyessus, who pointed to local nurseries and farms that can always use extra help. Fontenot said all the workers volunteered for the project. "This gives me something to do," said inmate Stacy Levier, who said his family had a small garden when he was growing up. Helping him plant a row of tomatoes was inmate Jeremiah Johnson, who said all this is a first for him. "I'm happy to learn something I've never done before. It will be interesting to watch all this grow," Johnson said. "There is a joy in planting a seed and watching it grow," Ghebreiyessus agreed. "This can give the workers a lot of self-satisfaction and it helps reduce stress." "A garden is a good teacher about the value of hard work and the reward it brings," Fontenot said. Fontenot gave Opelousas City Court Administrator LaVonya Malveaux much of the credit for the effort, though Malveaux said all she really did was help connect the dots. Malveaux serves on the St. Landry Parish Adult Reentry Coalition, which seeks to help inmates find jobs once they are released. "We wanted to see that our inmates get some skills so they can create their own businesses. I'm excited to see the jail, parish government and the sheriff's office all connecting with a university," Malveaux said. The garden is located in Councilwoman Fekisha Miller-Matthews' district and she said she supports the initiative. "Anything that will save the parish a little money will help out. Anything that is not taking money away from something else is good and our inmates are learning skills they can take with them," Miller-Matthews said. Mila Berhane, a sustainable agriculture specialist with the AgCenter, said the garden will be a year-round project. "In the fall, we will be planting mustard greens and collard greens, broccoli and green onions, which are very popular around here," Berhane said. "We are growing what the inmates want to eat." Fontenot said if the project works out as well as he hopes, the parish may even add a greenhouse, so the work can continue through the winter months. Baton Rouge, LA – Dr. Adell Brown, vice chancellor for research at the Southern University Agricultural Research and Extension Center and president of the 100 Black Men of Metro Baton Rouge was honored on April 6 as one of six exceptional community leaders across the country by 100 Black Men of America Inc.
Baton Rouge, LA - Are you interested in an alternative to gasoline? 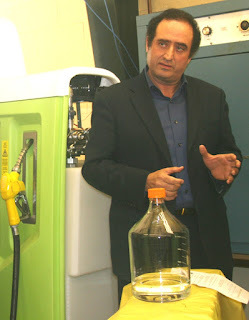 Well, Biofuel technology is your answer! You can be making fuel at home. The urban forestry scientists at Southern University’s Agricultural Research and Extension Center are conducting research on converting woody biomass to biofuel to help the bio-economy take hold. BATON ROUGE, LA – USDA requires everyone's help to stop the unintended introduction and spread of invasive pests into the country. The federal and state agencies can't do it alone. USDA urges the public to visit www.HungryPests.com to learn more about invasive pests and what they can do to protect American agricultural resources by preventing the spread of these threats. You can also engage in the invasive pests issue via Facebook and Twitter. In Washington, April 2, 2012, the U.S. Department of Agriculture's (USDA) Animal and Plant Health Inspection Service (APHIS) announced that it is dedicating the month of April to sharing information about the threat that invasive plant pests, diseases and harmful weeds pose to America's fruits, vegetables, trees, and other plants—and how the public can help prevent their spread. APHIS works each day to promote U.S. agricultural health and safeguard the nation's agriculture, fishing and forestry industries. At www.HungryPests.com, a website available in both English and Spanish, visitors can access the interactive Pest Tracker to see what pests are threatening in a selected state, and to learn how to report suspected invasive pests. The public can also engage on the invasive pests issue via Facebook and Twitter.